Only 1 bungalow located right on the beach. 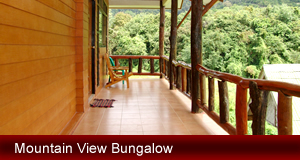 The bungalow has private terrace and facing sunset coast which you can see sunset by overlooking to the andaman sea. 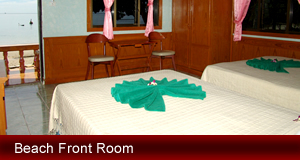 Room facilities ; a/c, fridge, hot & cold shower, own balcony. 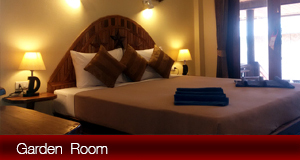 There are altogether 3 rooms located a few minutes from the beach. 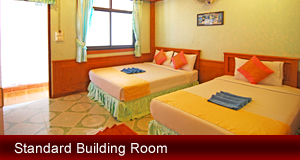 The room size and decoration are exactly the same as beach front bungalow. come with a/c, fridge, hot and cold shower, own balcony. 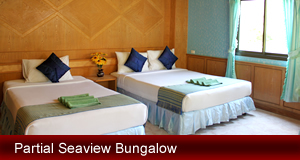 There are 2 rooms set on the second floor of Partial Seaview Bungalow. The facilities are the same from others. There are altogether 5 rooms set in the two stories building. The building located behide the garden view. The room size and decoration are exactly the same . Rooms come with a/c, fridge, hot and cold shower, own balcony. There are altogether 4 bungalows located behide the garden view near the sea and surrounded by tropical garden view. The bungalows come with fan, shower, toilet attached, own balcony. There are altogether 5 rooms. The building located in the garden view. The room size and decoration are exactly the same . Rooms come with a/c, fridge,TV, hot and cold shower, own balcony.